Ever ignorant Sanjay Jha, Ajay Maken of Congress and other geniuses of AAP said Narendra Modi promised Rs 15 lakhs would be deposited in accounts of ALL Indians when black money recovered. Only a top-rated genius Ajay Maken would say that these words amount to promise that Modi will give 15L-that too to ALL Indians. So, what did Modi promise w.r.t. black money? He said he’ll distribute a portion of it among the salaried who honestly paid taxes. In a “Chai Pe Charcha” session & in a rally, Modiji said it. Even with this promise, many media reports irresponsibly wrote that Modi promises to distribute the entire black money recovered to the salaried class. Google it and see for yourself 🙂 Here is Modi‘s Chai Pe Charcha Video portion clearly *promising* something. This is what *promise* means. In the video above, Modi says 5-10% of the recovered black money will be distributed to the salaried class who have honestly paid taxes all their life. Before this is distorted, note that he refers to a ‘portion’ of the recovered money – 5-10%. “I have heard 3-4 occasions where Modi refers to 3L/15L. I will concede if he has said elsewhere that every Indian will get 15L” – Tweeted @KartikeyaTanna !! But don’t give me the rubbish that words obviously aimed at giving an idea of *magnitude* of evasion = promise of giving 15L to ALL Indians. 100 din ke andar karyavahee prarambh kar denge !! Seriously, how much of a genius would you be if you say “process will be started in 100 days” = “black money will be brought in 100 days”? 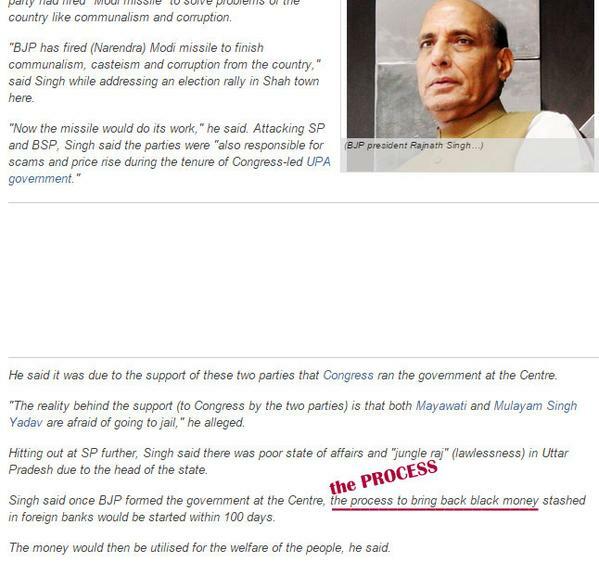 And, this is a screenshot from a media report – a rare one – which accurately translated Singh’s words in English. Some of the journalists with Economic Times, however, kept continuing with their irresponsible inaccuracy. So dear Mr Maken and Mr. Jha, please in future, first check, verify and authenticate a media report, or it is better that you start listening to Mr. Modi.